Isn't it funny where inspiration can come from. When I posted the photo of that mess on my cutting table, I noticed how nice I thought those orange Amy Butler dots looked with that Kona Coal. It's not a combination I would have ever thought to put together (and not why I bought that Kona), but I'm liking the results. I couldn't decide on a layout, so I have a mis-matched set. I'm hoping to finish these up this afternoon after some unfortunately necessary housework. Oh, and if you have a chance today, stop by Janice's blog, Sew Girly! She's hosting her first giveaway and the prize... Flea Market Fancy! How awesome is that! I think Kona coal looks so good with almost every color...except brown, but I'm sure there's someone more adept than I who could figure out how to make that work. The placemats look terrific--and they're not mismatched, just coordinated! Man, I wish it was easier to get all the Kona colours in the UK! Looks lovely. Wow Melanie! Those blocks look sharp! I see you are putting some of that mono pez to good use. I got your swap fabric today. Thanks so much for the extra pez piece. I'm seriously horading all I can find. Your package it on its way. I got busy at work and didn't get the the post office during my lunch in the beginning of the week. WOW...that is a striking combo!! Love the way the oranges really pop of the grey...who would've ever thunk?! Can't wait to see it all finished. I think I need to get me some of that coal fabric! I have been seeing it used more and more lately, and it looks so cool. Love it with your oranges. 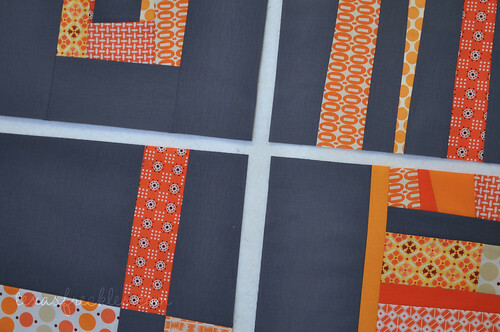 I love the mismatching you have going on with your placemats - what a fun project! 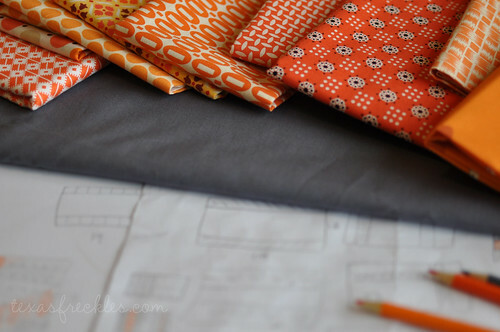 i just got my first yard of kona coal (i love grey..) this week and i have lots of oranges like you - so sooner or later i am toally going to steal this great combo-idea! This combo is fabulous! I love it. So many great oranges - and they do look great with the Kona coal. I love orange and grey together. Actually, I love grey with everything.